This hand-made copper wire-work pendant is inspired by sea lavender, a coastal shrub with beautiful purple and white flowers. 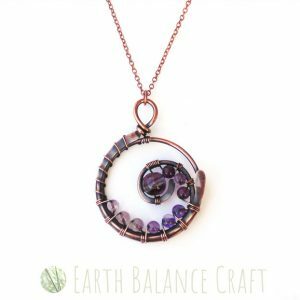 The amethyst and fluorite gemstones compliment the oxidised copper detailing perfectly, following a gradient of colour from deep purple through to translucent lilac through the spiralling contours. Designed for those who love the coast and ocean, whose hearts sleep by the sea. 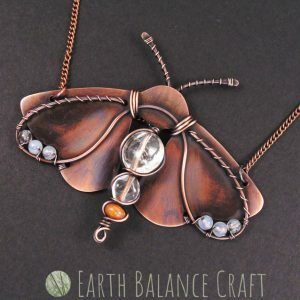 Inspired by the ‘White Ermine Moth’, this necklace design is handmade with oxidised copper metal and adorned with gemstone beads. This British species of moth is a handsome fellow, he is white in colour with dotted black spots and distinctive black antenna. A curved copper bar necklace adorned with white moonstone beads. This design is inspired by the translucence of morning dew drops as the sun starts to rise over a misty forest floor. The necklace is designed to sit delicately just below the collar bone drawing attention to the décolletage, where the metallic copper highlights compliment the shimmering moonstone beads. A polished copper bar necklace set on a delicate chain, hand-made with raw solid copper designed for arthritis sufferers. The copper bar has been shaped to follow the curve of your neck line and lightly hammered and textured creating sparkles of warm coppery tones and metallic highlights. This necklace design is a contemporary take on traditional arthritis jewellery with a modern and minimalist paddle style of wire work. A copper bar necklace with dangling copper leaves each with a watery semi-precious gemstone droplet. Inspired by our love of woodland and forest, hearing the rustle of wind through summer trees like a gentle melody. This design is both contemporary and Bohemian in style. The copper bar and copper leaves have each been hand cut, filed, polished, darkened with patina and hand painted with a gloss varnish. Phew! The rustic copper bar has been lightly textured to catch the light with dappled shades of metallic coppery tones. This necklace is part of a set with matching earrings. A delicate copper pendant outlining the pretty contours of pink cherry blossom flowers. The petals are adorned with soft pastels and dusky pink colours in the jade, rose quartz and rosaline Czech glass beads. Inspired by the best season of the year, when spring trees are abundant with nature’s confetti. This design makes the perfect gift for nature lovers. An autumnal elven styled necklace featuring a variety of warm red and orange agate gemstones and glass. Inspired by the the colours of falling leaves in autumn, when the forest floor is abundant with crimson colours like a vibrant carpet. 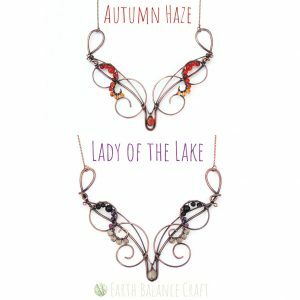 Inspired by the Elven goddess ‘Lileath’, known as ‘the lady of the lake’, the goddess of dreams and prophecy. This fantasy design features a deep colour palette with black, purple and misty grey semi-precious gemstones. Moss of the Woods Design. This design is made up of deep browns and greens set against the polished patina metal tones. Inspired by the depths of the forest, with earthy textures and woodland colours, nurturing and calming. A curved copper bar necklace adorned with grey moonstone beads. A design inspired by the beauty in falling rain drops that pitter patter on the ground, I am always captivated by that mesmerising sound. The watery grey colour palette reflects the dull daylight when it’s raining, and the heaviness of low cloud. The necklace is designed to sit delicately just below the collar bone drawing attention to the décolletage.